3 bedroom Weymouth caravan offered for holidays in Dorset. 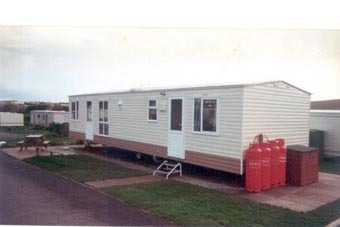 3 bedroom Weymouth caravan, offered for holidays on Weymouth Bay, Weymouth, Dorset. 2009 SEASON Luxurious 3 Bedroom Caravan For Hire on Weymouth Bay Holiday Park, (Haven family site), luxurious top of the range caravan, 38ft x 12ft, three bedrooms, six persons maximum, 20 inch LCD Digital TV with Digital TV Recorder, Sky Digibox giving Sky Free To View Channels, a Video cassette recorder and Hi-Fi with 3 CD auto-change Player, Cassette Player and Radio, microwave, fridge with separate freezer, full sized bath with shower, Hoover, iron with board, laid out patio with picnic bench table & parasol, free gas and electricity, all amenities on site, sorry no pets. On site facilities include indoor/outdoor pools, club complex, restaurant, bars, family entertainment. Entertainment passes are available at charge.